Friends of Jonathan Acierno '02, who passed away on January 18, 2010, sent us the following remembrances of him. Jonathan Acierno and I met on one of my first few days at Wagner as I was walking along Trautmann Square. I, a lonely, nervous, visually impaired freshman from Pennsylvania. He, a friendly, knowledgeable senior from Staten Island. Our close friendship began instantaneously, and we spent every possible minute together both on and off campus. It quickly became clear to me that Jonathan was a very special and unique individual. It seems like each day I would learn about another activity that he was involved in. At Wagner, he was a member of Club Diversity, the Newman Club, Free the Planet, Students Against Destructive Decisions, and the Film Society. He was vice president and president of the Rotaract Club, where he assisted with bringing students to Wagner from around the world, and he represented them at the United Nations for Rotary International Day. He was the president and founder of the Commuter Club, and a proud member and student government representative for the Omicron Delta Kappa national leadership and honor society. In his spare time off campus, he was actively involved with the Epilepsy Foundation and the March of Dimes. He was also a CCD teacher and he volunteered at a nursing home. 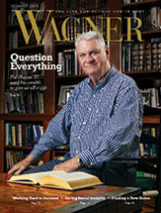 While at Wagner, he became a Eucharistic minister, and was able to give communion at the nursing home. He volunteered by mentoring a child, helping the Parks Department, working with Habitat for Humanity, Catholic Charities, and Catholic Big Brothers/ Big Sisters. In addition, he recognized the value of hard work, and he held many campus positions. He worked at the switchboard, Parise Fitness Center, career development office, Union desk, student activities office, Hawk's Nest, Harborview and Towers desks, and the alumni office. He also worked in the Spiro Computer Lab, where he assisted me with getting a job and we often chose shifts together. Jonathan also had more school spirit than anyone, making him the perfect admissions tour guide and student ambassador. He also worked as a tutor in basic computer science and religion. It appeared as if Jonathan spent every waking hour on campus from early morning until late at night, and it is no wonder he seemed to know everyone there. Since he was there so much, we got to eat many lunches and dinners together in the dining hall, including a dinner on September 10, 2001, where we admired the Twin Towers from our table as we waited for the rain to stop. During his time at Wagner, Jonathan received numerous awards. He was the first student to receive the Leader on the Horizon Award. He also received a Congressional Certificate of Recognition, and the National Achievement Academy All American College Scholar Award. He was also chosen by former President Norman Smith's wife for the Committee on Co-Curricular Transcripts to screen students for admission into the college. Upon completing his bachelor's in sociology with a minor in religion in 2002, Jonathan went on to receive his master's in higher education from New York University. 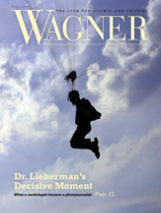 Because of all of his achievements while at Wagner, he was the first student to receive a PhD scholarship for a master's program. While there, he held a GA position in the dean's office, published two books, and began to travel the world. Afterwards, he became a college career counselor. More recently, he was selected for inclusion in Who's Who in America, and its 65th edition will be published in 2011. Even after leaving Wagner, Jonathan remained a part of its community as he regularly attended alumni and other campus events. His passing is not only a loss to his friends and family, but also to the Wagner community and beyond. Wagner meant so much to him. It inspired him to grow and in turn inspire others. His generosity and active spirit were awe-inspiring, I am privileged to have known Jonathan, and I am honored that he called me his friend. A brother is someone that many people have but often take for granted. One thing I learned from this ordeal is to never take your family for granted and to live each moment to the fullest. He was the kind of brother who always put a smile on your face no matter what the situation was. He taught me to see the best in everyone and to never give up on my dreams and eventually they would come true. Jon was also the type of brother who did not treat me like a little kid but always like an adult. He always believed in me and treated me like a friend rather than a sister. One of the most rewarding experiences we had together was travelling abroad to Ireland, where we got to know each other a lot more. I truly learned so many things and found out how much we had in common. He stuck by me through thick and thin and always made me put my best foot forward. One thing that Jon was extremely happy over was the fact that he got to attend Wagner. He did so much on campus, and often stayed on campus until 2 or 3 a.m. He felt like Wagner was his home away from home. Jonathan was the reason why my brother Michael and I went to Wagner, because he felt it would help shape us into wonderful people. Jonathan was part of so many organizations and clubs on campus. 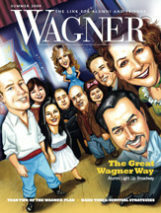 When I came to Wagner, I ended up joining most of the same things that he did. He encouraged me to get involved so I would not be so afraid of Wagner. 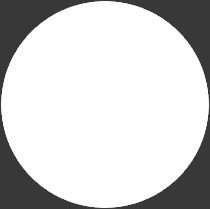 He told me what to join and why. As an undergraduate at Wagner, whenever I was not busy with my schoolwork, I was always involved with one of the organizations and clubs Jonathan belonged to. One of his favorite clubs was Club Diversity, which promoted diversification and learning about others. This club did not exist when I came to Wagner, but it did encourage me to take part in Diversity Day. My brother was a mentor to students outside the Wagner community, which inspired me to not only become a teacher but to tutor young students with special needs. My brother Jonathan made an impact at Wagner College just like he did with so many people. I remember him at my 2008 graduation ceremony, so proud and happy for me. When I finally made it into ODK, he was so excited and thrilled for me. He helped me aspire to go to graduate school here at Wagner and to further inspire others. My brother was a mentor to me, and he lives on and will never be forgotten.